Happy Saint Patrick’s Day! I confess I don’t know a lot about the real dishes of Ireland; the dishes people grew up eating around their family tables. I only know that around here, people eat corned beef and cabbage and drink copious amounts of Guiness Stout. In order to do something a little more authentic than four leaf clover shaped cookies, I consulted my fabulous and too-far-away friend, Elisha Clarke on some of her favorite Irish dishes. Elisha was born and raised in Ireland and TODAY is her birthday! I very much feel the luck of the Irish because I know her! She is an amazing photographer and I hope one day I can go hang out with her in Ireland and see first hand the beauty she gets to photograph every day. When I asked her about dishes she grew up loving, she listed five or so and Irish stew actually wasn’t one of her favorites, haha. 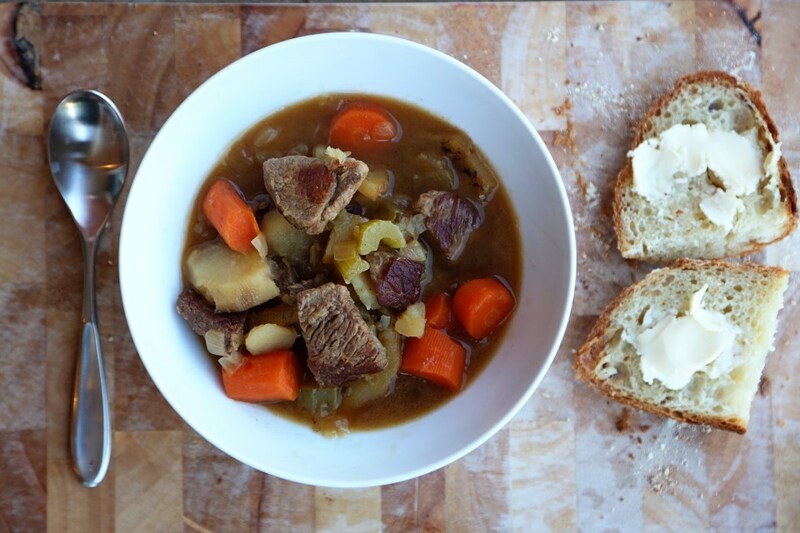 But then she sent me a link to a cute, Irish celebrity chef doing this stew on Jaime Oliver’s show and he made it look so simple and delicious, I had to try it! It came together easily and as it cooked for over an hour, I had time to relax with my family! As I took the first bite, I was immediately transported to my own dining table as a child. My mom made beef stew quite often and would let it simmer on the stove while we were at church. I always loved it and she served it with saltine crackers that we’d crush up into our stew. Tasting this very similar Irish lamb version made me smile – thousands of miles separate the humble meals of working class Americans and working class Irish, yet we are instantly connected by a warm meal. Elisha mentioned that her country has very poor origins and so therefore, the traditional dishes are very humble in nature. I think all the best dishes in any culture originate from people making the best of what they have been given. My family did it, Elisha’s family did it, and if I were to guess, I’d say that probably most of you could relate to that story, as well. A simple bowl of warm stew on a cold evening can comfort and connect family and friends, no matter how far apart. Preheat the oven to 325F. Return the meat to the pot, along with the bay leaf and stock, season with kosher salt and ground black pepper and bring to the boil. 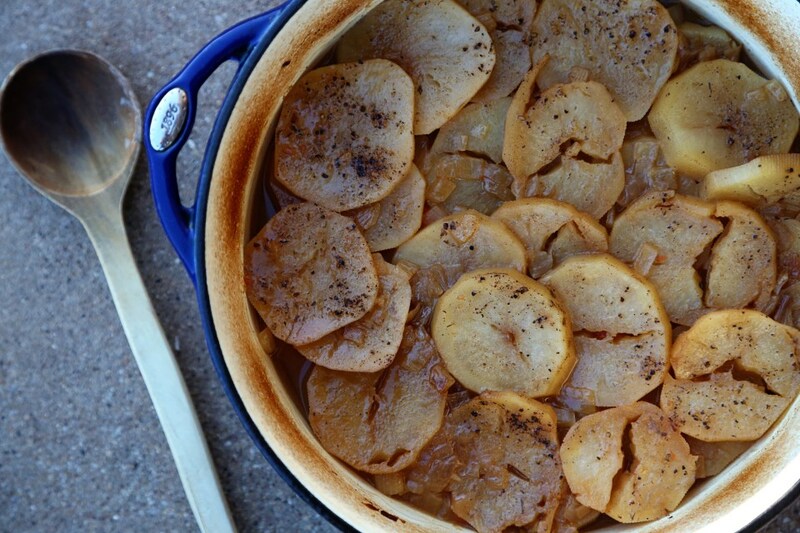 Remove from the heat and push the slices of potato down into and across the top of the stew, dot with the butter and give a final seasoning of sea salt and ground black pepper. Cover and place in the oven to cook for about 1½ hours or until the meat is tender, then remove the lid and cook for a further 10 minutes until the potatoes have browned. 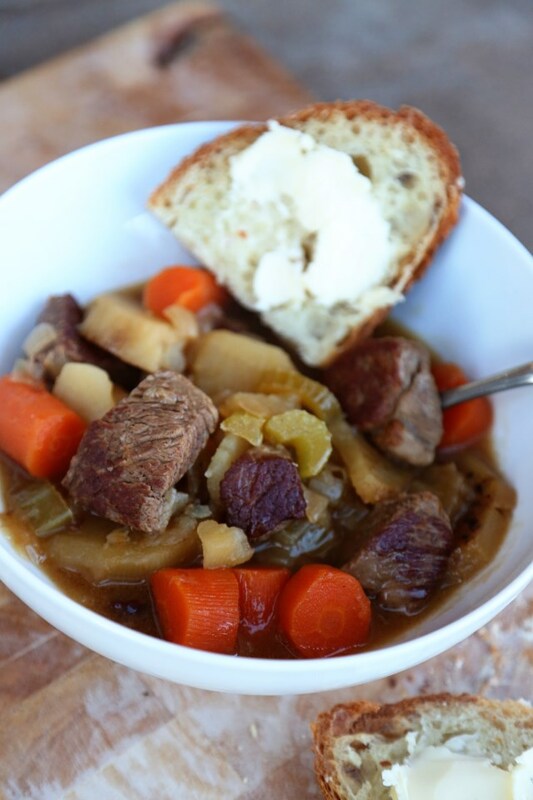 Serve the stew in deep bowls with crusty, buttered bread to mop up all the juices! Happy Saint Patrick’s Day! I feel like this recipe isn’t right for the kind of weather we’re having this week, but you never know – in Lubbock it’s sunny and 70 one day and the next day it snows 4″ (true story). So maybe by the time you read this, it will be frosty, again. I had ossobuco for the first time six years ago in our tiny apartment, cooked by Matt, and ate it sitting on the floor, pulled up to a coffee table watching t.v. I shamefully write that, but at the time, I don’t believe we had a dining table. Hard to remember why else we’d eat such a nice meal on the coffee table, so dangerously close to our dog. What I do remember is how amazed I was at the flavor of the braised meat and how strange I thought it was that Matt said you were supposed to sprinkle this parsley junk on top. The “parsley junk” was actually gremolada and it’s actually really perfect to cut the richness of the dish. 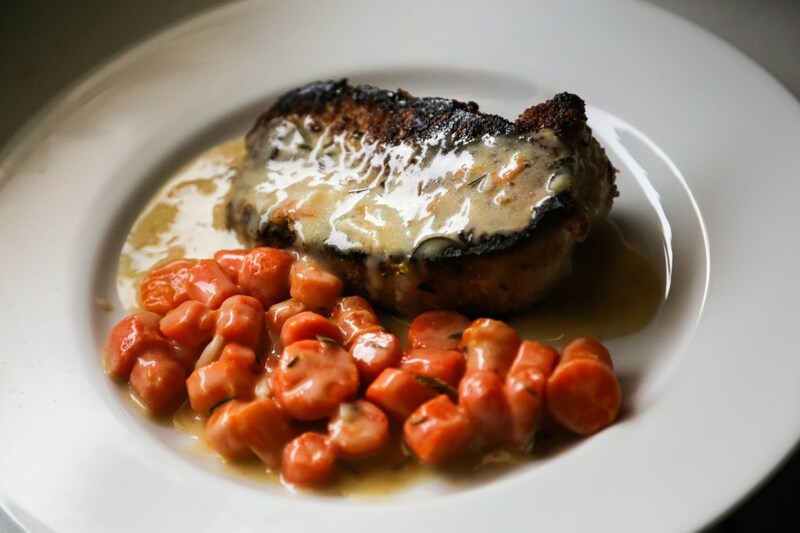 Parsley, lemon peel and garlic cut right through the melting texture of the veal shank. I instantly loved the combination. We made a lot of food discoveries in that apartment. Neither of us grew up with a whole lot of adventurous cooking in the house, but when we got married, the adventure began. Neither of us knew what we were doing (I knew the basics and how to navigate the kitchen and Matt can follow a recipe to a fault) but we had an obsession with the then-better Food Network and cookbooks and chef biographies and eating and really, you need little else in order to get on with your own cooking adventure. Matt and I have a saying about pizza that there’s really no bad pizza. Cardboard frozen pizza, pizza pockets, bagel bites – we’ll eat any of it. And I feel the same way about risotto, ossobuco’s best friend. We’ve made it too thick and we’ve made it too crunchy and we’ve made it too thin and I’ve even been at a restaurant where they FRIED it, and in the confession booth, I would have to admit that I loved it all. It’s just…comforting. It’s a rice dish that could very well be as comforting as mac and cheese, and that’s saying something coming from an American. Since I’d been to the lovely Ghandi Bazaar a few weeks ago and bought some ridiculously cheap saffron, we decided that for this meal, we’d just do it up right (we’d always omitted the expensive ingredient) and use the saffron. If you need to borrow a pinch and you live close, drop on in. Or go see the lovely people at the Ghandi Bazaar on 34th and Quaker. They keep it behind the counter. 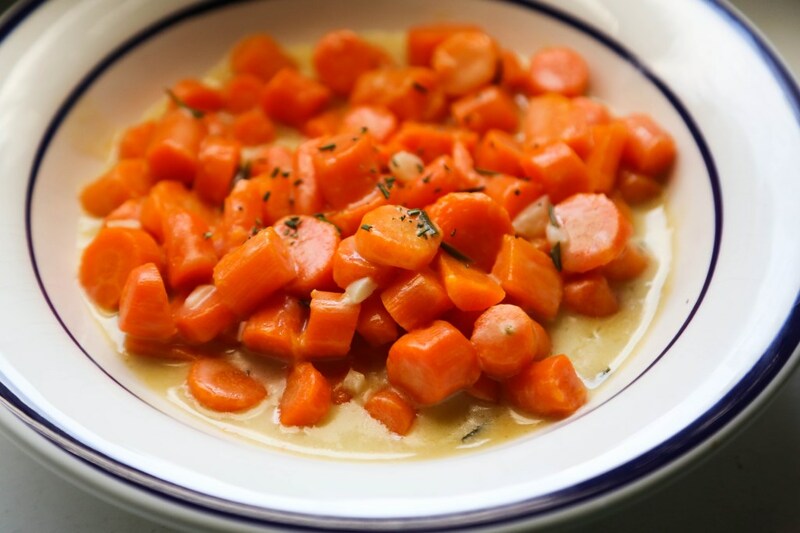 In a heavy bottomed dutch oven or stock pot, heat to medium and throw in the onion, carrot, celery and butter and cook for 6 to 7 minutes. Add the chopped garlic and lemon peel and cook for another 2 to 3 minutes until the vegetables soften and wilt. Remove from heat. Put the vegetable oil in a separate skillet and turn on the heat to meium high. Turn the veal shanks in the flour, coating them all over and shaking off the excess. Don’t do this ahead of time or they will get soggy. When the oil is shimmering hot, add the shanks in two batches of four (they should cover the bottom of the pan but not be crowded) and brown evenly on all sides. Remove them from the skillet and place them side by side over the chopped vegetables in the dutch oven. Tip the skillet and spoon away all but a little bit of the oil. Add the wine, reduce it by simmering it over medium heat while scraping loose with a wooden spooon the residues that get stuck to the bottom and sides. pour the skillet juices over the veal in the pot. Pout the broth in the skillet, bring to a simmer, and add it to the pot. Also add the chopped tomatoes with their juices, the thyme, bay leaves, parsley, pepper and salt. The broth should have come up two-thirds of the way up the sides of the shanks. If it does not, add a little more. Bring the liquids in the pot to a simmer, cover the pot tightly, and place it in the lower third of a preheated oven. Cook for about 2 hours or until the meat feels very tender when prodded with a fork and a dense sauce has formed. Don’t be in a rush – more cooking is better than not enough. 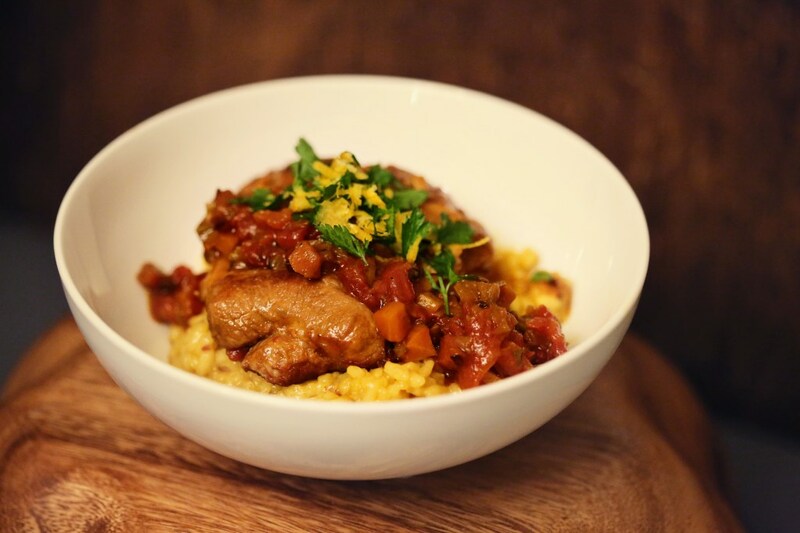 When the ossobuco is done, transfer it to a warm platter, removing the trussing strings, pour the sauces in the pot over them and serve at once on top of a bed of risotto and garnished (on the side) with gremolada. Bring the broth to a slow, steady simmer on a burner near where you’ll be cooking the risotto. 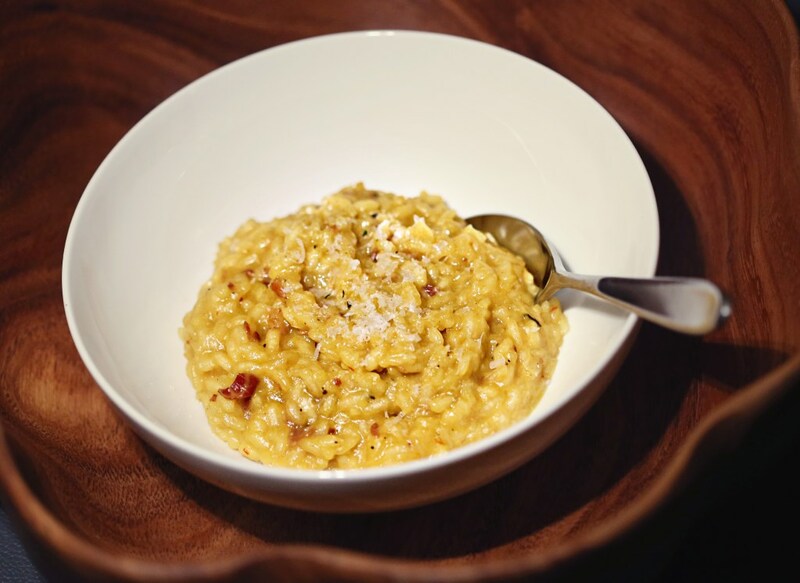 Put the diced pancetta, one tbs butter and vegetable oil, and the chopped onion in a broad sturdy pot (we use this one – our go-to risotto pan) and turn on the heat to medium high. Cook and stir the onion until it becomes translucent, then add the rice. Stir quickly and thoroughly until the grains are coated well. Add 1/2 cup of simmering broth, and cook, stirring, until all the liquid has mostly evaporated before adding another ladle. Keep doing this over and over and over and over, stirring all the while. When the rice has cooked for 15 minutes, add half the dissolved saffron liquid. Continue to stir, and when there is no more liquid in the pot, add remaining saffron liquid. Finish cooking the rice, tasting for doneness. The rice shouldn’t be crunchy any more, but shouldn’t be mushy, either. Go for that nice al dente, much like pasta. Off the heat, add a few grindings of pepper, the remaining butter, all the Parmesan and stir thoroughly until the cheese melts and clings to the rice. Taste and correct for salt. 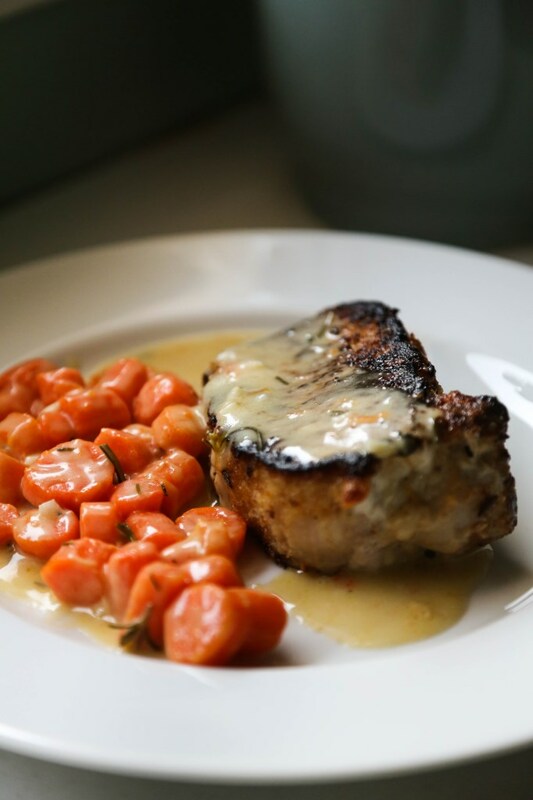 Serve with ossobuco! *all recipes come from the wonderful book, Essentials of Classic Italian Cooking. Go buy it!